Many carpet cleaning professionals in San Antonio also perform tile and grout cleaning as well as upholstery cleaning. Beyer Carpet Cleaning is no exception to this rule. Beyer Carpet Cleaning can perform carpet cleaning, tile and grout cleaning, and upholstery cleaning any time! Their professional technicians are prepared and ready to tackle any cleaning job. However, although they are best known for their outstanding carpet cleaning Beyer Carpet Cleaning is also well known for their tile and grout cleaning. Their tile and grout cleaning process consists of several steps. The first step to tile and grout cleaning is putting down an acid or alkaline cleaner. 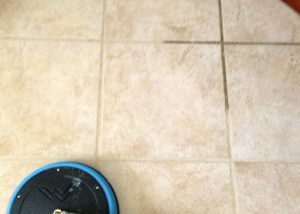 This helps remove any dirt, grease, or grim that is in the tile and grout. 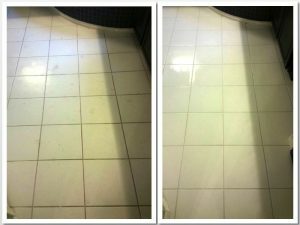 Once the cleaning solution is sprayed onto the tile then the technician will scrub it in to ensure the best possible clean. After scrubbing each tile and grout line the technician will then processed to steam clean removing the alkaline cleaner and whatever gross stuff was scrubbed from the floor. Once the floor has been steam cleaned and everything has been removed the tech will dry the floor. After being dried you will be able to see the difference right away. 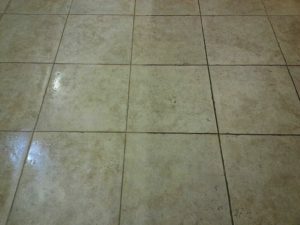 Essentially what you are paying for is not just a tile and grout cleaning but a tile and grout restoration. If your tile and grout were once white but turned black or grey over the months and years it will now be white again. You may be thinking this sounds expensive but truthfully Beyer Carpet Cleaning has the lowest prices in San Antonio for professional tile and grout cleaning. At only $0.50 per square foot with a $99 minimum Beyer Carpet Cleaning will perform a professional tile and grout cleaning for you. If you have an insane amount of tile and grout that needs cleaned they are willing to work on price with you (depending on the size). Beyer Carpet Cleaning does not disappoint when it comes to tile and grout cleaning. They will leave your home having you super impressed and amazed as to how beautiful your tile and grout looks once again. Call Beyer Carpet Cleaning for all your cleaning needs.